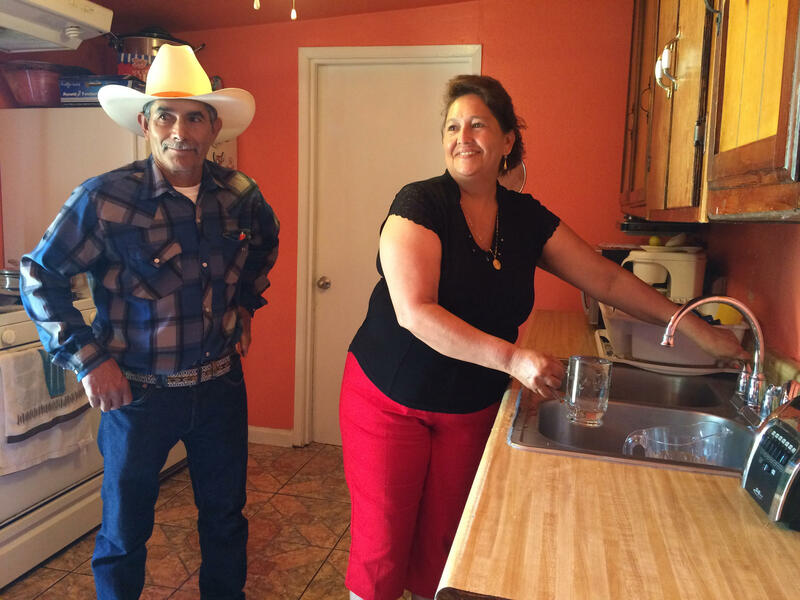 East Porterville residents Leonicio and Guillermina Ramirez can run their kitchen faucet for the first time in three years. In 2014, Governor Jerry Brown declared a drought state of emergency as wells across the state began to run dry. This just two years after California became the first state to legally recognize water as a human right. And yet, thousands of residents remain without water, as the state estimates 2,000 wells have run dry. While temporary relief has come to many, permanent relief has still been slow to arrive. 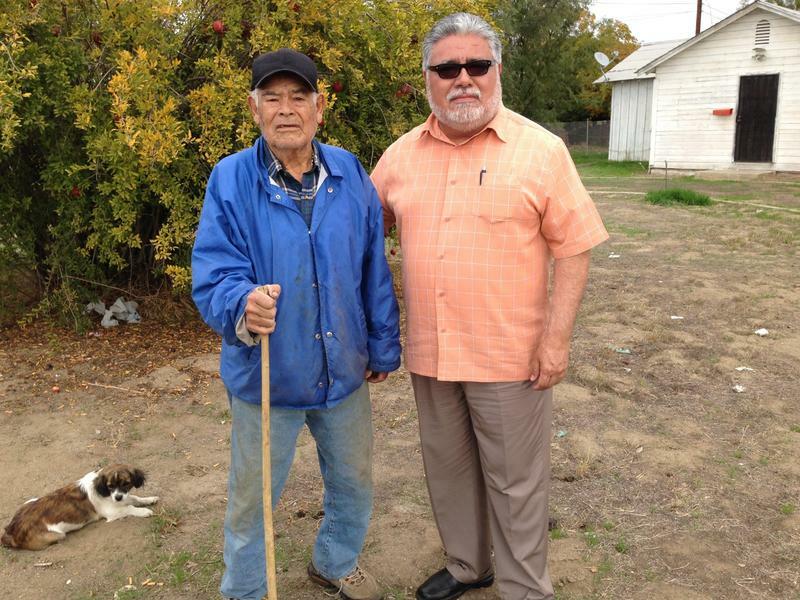 Last Friday, a solution finally came to one of Tulare County’s hardest hit communities—but it wasn’t easy, and it’s not the end. When you don’t have running water, even the simplest activities require planning, creativity and hard work. 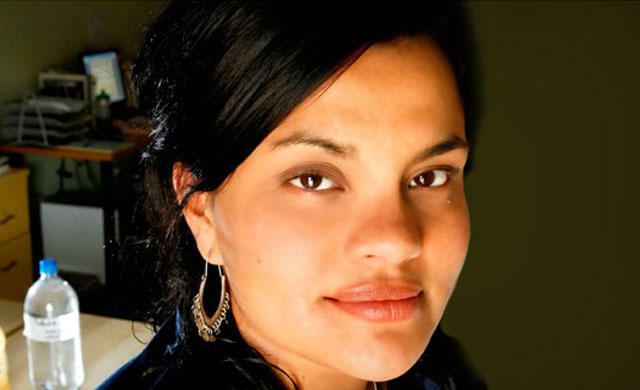 Just ask Leonicio Ramirez of East Porterville, a farm worker who picks oranges and grapes. Until last Friday, he didn’t have running water in the house where he lives with his wife and three children. After a long day in the fields, he says in Spanish, he’d drive to one of his sons’ houses to fill up 50-gallon drums of water. They’d heat that water on the stove and haul it into the bathroom to bathe. Ramirez’s wife Guillermina, also speaking Spanish, says they’d plug the drain in the bathtub so they could reuse the bathwater on their plum and pomegranate trees. Tania Ramirez and parents Guillermina and Leonicio Ramirez at an event kicking off the first East Porterville residence to be consolidated with Porterville’s water system. That was the Ramirezes’ reality for three years, after the well in their home ran dry. But on Friday, that reality changed. 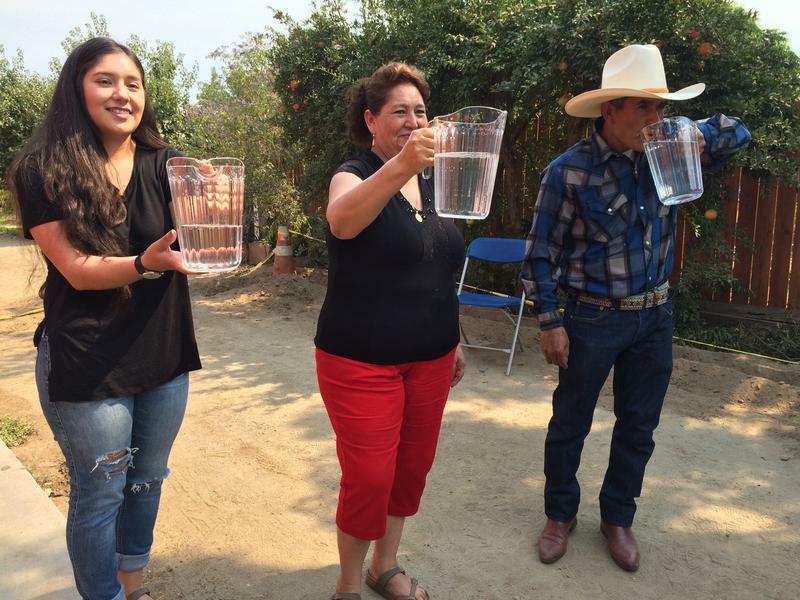 The state is connecting East Porterville to the public water system of nearby Porterville—and the Ramirezes’ home was first. After speeches from local officials, daughter Tania Ramirez opened a spigot outside her home, and out splashed crystal clear water. The cheers and applause that erupted represent more than joy and relief; they were also the sound of collaboration and compromise. East Porterville is small—about 7000 people—and yet, this project took years and involved negotiations between three state agencies, the county, local lawmakers, city officials and a handful of advocacy groups. 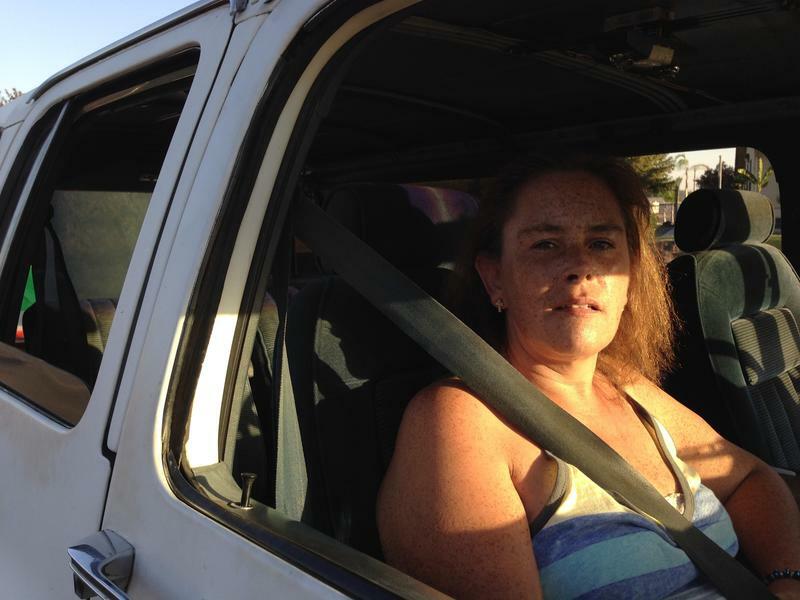 The drought has been a slow-moving disaster in East Porterville. The first wells ran dry in 2013 and 2014. Neighbors relied on each other for a while. So-called “water angels” made water deliveries. The tally of dried wells ticked higher and higher until about a third of this unincorporated community was without water. 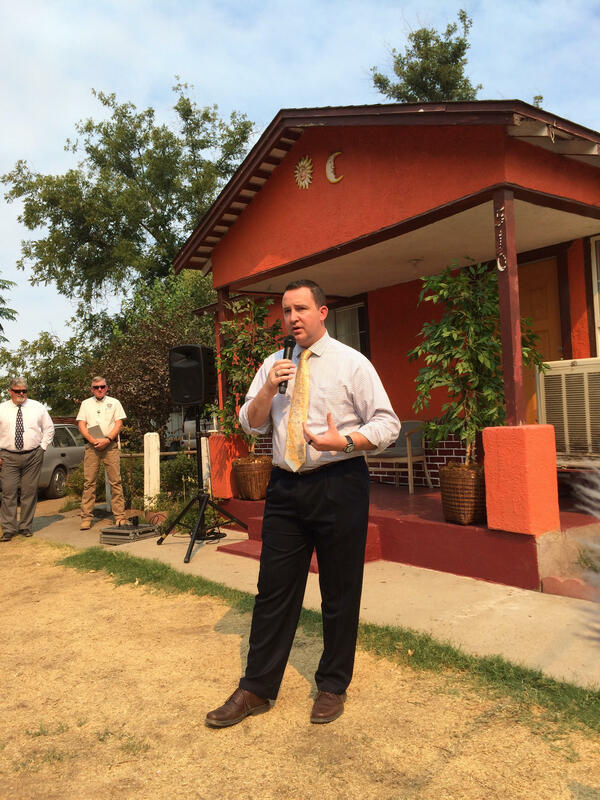 Assemblyman Devon Mathis speaks in front of the Ramirez family home in East Porterville. This from-scratch solution involves taking roughly 1,800 homes, most of which have private wells, and hooking them up to Porterville’s municipal water system. It’s called a consolidation, and officials expect the whole community to be consolidated by the end of 2017. It’s unclear how much it’ll cost in total; state officials estimate the first round of 500 homes, to be completed by late 2016, to cost around $10 million. For contrast, emergency water services cost over $7.5 million each year in East Porterville alone. 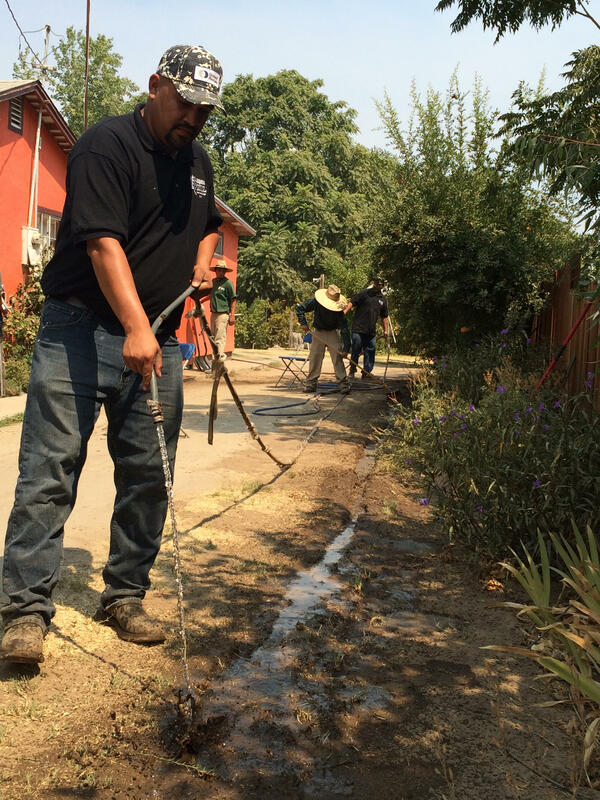 Workers fill in ditches after installing water pipes at the Ramirez family home. Property tax wouldn’t necessarily increase, but residents would see higher utility bills and more sales tax at East Porterville businesses. Homeowners who choose not to consolidate will lose out on emergency water services. By the state’s estimate, around 1,500 dry wells still remain. The trouble is, no one solution will work for every thirsty community. Just as the Ramirezes had to get creative, it seems, so will the state. In East Porterville "They Were Drinking Water That Looked Yellow And Red"
This story is part of a Valley Public Radio original series on how the health of rivers impact the health of communities produced as a project for The California Endowment Health Journalism Fellowship, a program of USC's Annenberg School of Journalism. Drought conditions in parts of Central California have become so harsh that it’s normal to turn on the tap have no coming out. A few months ago we brought you the story of East Porterville where more than 600 homes are without water because their household wells have dried up. Now, some of the town’s residents will have access to something they haven’t had in months. The last time Gilberto Sandoval took a warm shower was over a month ago. The drought in Central California has hit many farmers and homeowners hard. 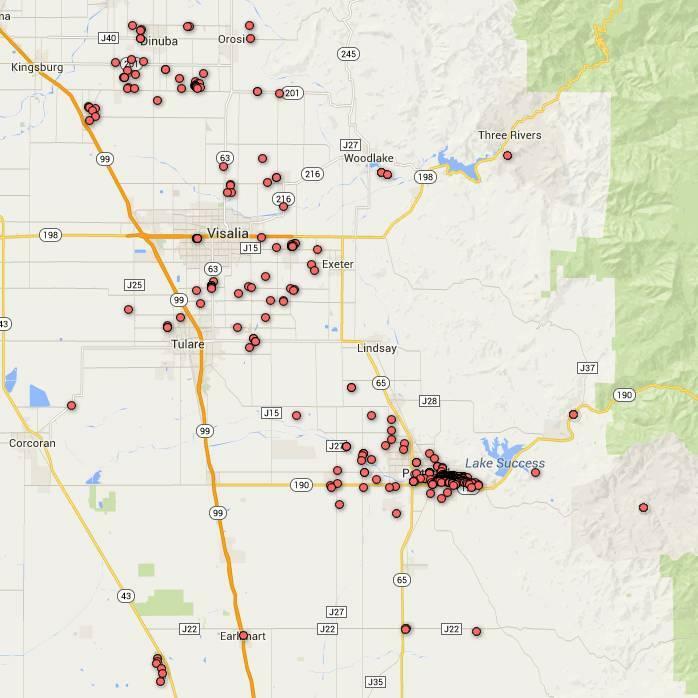 Perhaps those hardest hit are in Tulare County where the number of dry wells spiked this week. New data released today from the Tulare County Office of Emergency Services reports the number of private well failures in the county grew by 19 percent since October 6. Andrew Lockman with the agency says the increase is due to more homeowners reporting dry wells and new data from partnering agencies.